Parallax scrolling or more commonly known as parallaxing is the effect usually used in 2D games that gives the impression of 3D depth. Whilst Booty5 does not currently support 3D it does support depth sprites / actors. Depth sprites are sprites that are projected into the 3rd dimension. In real terms that means that sprites that are at a greater depth will move more slowly and be smaller than sprites of the same size but at a lesser depth. Actors have a “depth” property that tells the engine at which depth they should be rendered. 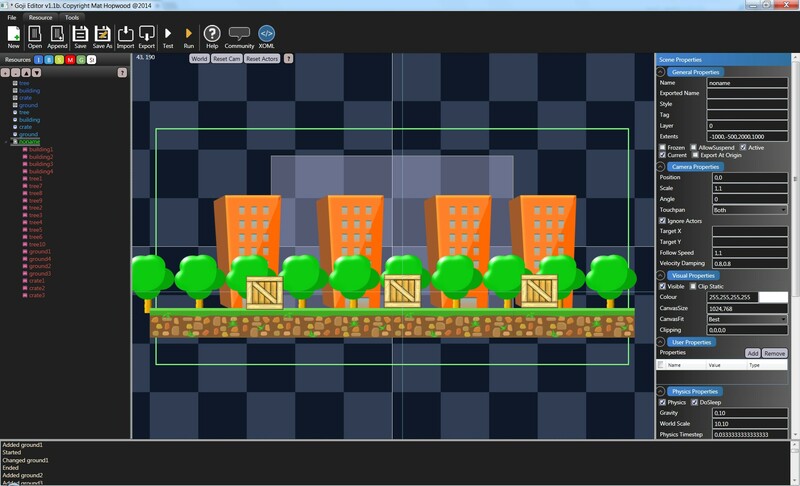 Note that Depth does not affect visual ordering and Booty5 does not currently apply depth when rendering depth sprites to the editors canvas. Currently you will only see the affect of depth when you run a test from the editor. When you hit Test, things will not look exactly as they do within Booty5, objects will not seem to be in their correct places or have the correct sizes. This is normal, because we changed the depth values of various actors they have now been projected into 3D. Pan the camera around and you will see that actors with greater depth values move more slowly the further away they are. You can download the complete finished project for this tutorial here.